If you’d accuse the average Seattleite of having a “suburban mindset” you’ll probably get a blank stare of confusion. Or perhaps indignation at having been given the ultimate insult. But face that same person with the possibility that his neighborhood of single-family detached homes, all on lots larger than 5,000 square feet, might soon get a slight bit more urban and dense, and watch the sense of outrage build; you might as well be delivering the same news to a resident of Phoenix or Orange County. Exhibit A is this article in a recent Seattle Weekly, and particularly the responses to it. One would think all the ranting about Latinos being “illegals” might have been written by Joe Arpaio’s demographic in conservative Phoenix. No, this is what the typical Seattle liberal acts like when his suburban ideal is violated. Look, I’ll grant that some of the houses being built are definitely over the top. If you go here and look at a gallery of them maintained by their opponents, you can see some examples of this. The houses at 6222 5th Ave NW and 5501 Kensington Pl. N definitely look shoehorned in (particularly the former). But many of them are obviously being built on double lots. Take a look at the photos of 3954 SW Rose St., 151 N 78th St., and 1605 21st Ave., for example. Why did such houses have such large “side yards” like that, prior to the new construction? Because when they were built, their owners purchased the lot next door, and the two lots have sold as a package ever since, that’s why. Turning a house built on a 10,000 square-foot lot with a very large side-yard into two houses on 5,000 square-foot lots (in a neighborhood of houses on such lots) is not “wedging” a new house into a neighborhood. Obviously, doing things like building a three-story monstrosity on a tiny 1,200-square-foot lot is over the top, particularly when (unlike in the anomalously-large-side-yard case) nobody has the least inkling such a separate lot existed in the first place. A single-story 800-square-foot cottage would be fine there, and a reasonable set of regulations and design reviews could have limited new construction to something like that. Unfortunately, a reasonable set of new regulations is the least likely outcome in all this. You only have to look to the gallery with all its hyperbole to understand that. Or to look at Seattle today and see how a history of exclusionary zoning, pushed by homeowners who, by and large, act like insecure suburbanites instead of city dwellers, has pushed those who cannot afford or do not desire to live in detached single-family homes on generous lots to the least desirable and most compromised areas of the city. First off, I will have to say that I wince every time someone spouts off about the most recent heat wave (or hurricane, or tornado outbreak, or other episode of extreme weather) being obviously caused by global warming. No, it’s not. Extreme weather was happening naturally before the Industrial Revolution started changing the composition of the atmosphere. Its mere existence is evidence of nothing save the existence of extremes, and extremes always happen in any varying, natural phenomenon. Of course, this cuts both ways: neither is the continued existence of cold snaps any definitive proof against global warming. But I digress. Anyhow, it’s not surprising that one of local meterologist Cliff Mass‘s recurring themes is poking holes in such claims. Such hole-poking is well and fine. Up to a point. Because, of course, there’s far more stupid and dangerous behavior going on with respect to global warming than some misinformed comments made by advocates of doing something about it. Sure, it’s fun to play Devil’s Advocate, and even useful to the debate for a healthy measure of same to go on, but there’s also this thing called scientific responsibility. And given what the downsides of continued, unabated modification of the atmosphere to future generations are, responsibility is not evidenced by being obsessed with debunking one sides’ errors, particularly when that side, flawed though it may be, is the one advocating for action to address the issue. Real evidence for global warming looks more like this. Extremes of cold are still happening, but global warming has loaded the dice. Not so much as in Krugman’s claim of 4 sides in favor of heat, 1 normal, 1 cool, but loaded nonetheless. 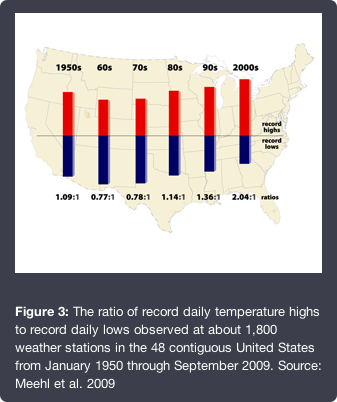 Extremes of heat now really do happen more frequently than those of cold. For starters, it would help if Mass discussed evidence like this more often. It’s very complex. There’s lots of settings to master. This sort of comes with the territory when shooting digital, and I expected it. The official documentation is, quite frankly, awful. Olympus only ships a very abridged printed manual with the camera, expecting users to consult a PDF file for any detailed information. Not a reasonable expectation, really, given that I don’t carry my computer with me into the field. And even the unabridged PDF version of manual is incomplete; see below for an example. This does not necessarily “come with the territory” and I didn’t expect at all. Press the button once to display the zoom frame, again to zoom in. Keep the button pressed to cancel zoom. “Excellent!”, I thought. I’m planning on using the camera, via an adapter, with my old Pentax telephoto lenses (which, thanks to the crop factor, will be twice as telephoto as they were before). “A way to force the camera into an MF assist mode with a single button press will be quite useful.” So I used the setup menu to assign the Magnify function to a button. And kept finding that button did nothing. I tried and tried pressing it for various lengths of time, pressing it while turning one or the other of the two dials, pressing it while holding the shutter button halfway, etc. Nothing ever worked. Until I happened across a blog post that prompted me to try it again, this time with the preview screen enabled to display a live view (normally it is off and one uses the EVF to preview the scene). That did the trick, but it shouldn’t have taken me over a week of experimentation followed by a number of Google searches to figure out something which should have been explicitly described in the manual. I’m still glad I bought it, mind you (and consequently just spent more money to round out a basic lens outfit for it). It’s just that using it would be a far better experience if only the manual were more complete. I’m still trying to withhold final judgement, but my most recent tests indicate that it really should work quite well for me. Recently took it camping, and the results were somewhat spotty: sometimes I could nail the focus, sometimes it just seemed to have issues. But that was trying to take pictures in windy weather (read: subjects waving in the wind), and I didn’t have a tripod (read: my own shaky hands were a factor). Sure, it has image stabilization, as pretty much all digital cameras these days do. But that only goes so far, and nothing works as well as turning IS off and mounting the camera on a tripod. Once I do that, focusing consistency seems to improve to what it is with a traditional film SLR. 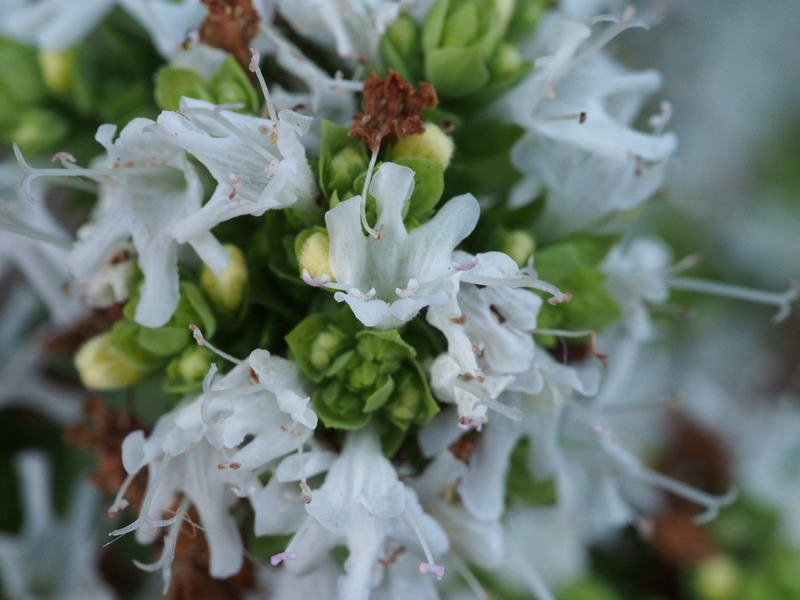 As an example, I tried to focus on the anthers of the floret in the center of the picture, and so far as I can tell that is where the focus ended up being. Sure, it’s a little wonky: the view isn’t exactly live and the lens doesn’t respond at the exact moment you twist the focus ring, and you hear a little motor racking the focus in or out a fraction of a second after you tweak the focus ring a little bit one way or the other. But, wonky or not, it is possible to manually set the focus with a minimum of fuss or bother. Really, given how fiddly macro photography is in general, by the time I’m done fiddling with the tripod and getting the framing right, the tiny bit of extra time it might take to focus is pretty much dust on the gears. And it’s not all a loss, either. That picture was taken in the shade at ISO 1600. There’s no way you can get ISO 1600 slide film: it’s just not made. And ISO 1600 print film is way grainier than the image I just got above. I’d have had to fiddle with an off-camera flash or exposure times in the range of a second (and hope a slight breeze wouldn’t ruin the shot) to get the same results on fine-grained slide film. Contemporary EVIL (electronic viewfinder, interchangeable lens) cameras, that is. Encouraged by looking through two recent electronic viewfinders (which have improved astoundingly in the past few years), I purchased an Olympus OM-D E-M5 yesterday. Just took a batch of macro pictures with it, mostly using manual focus. Unlike a compact digicam, it’s totally usable for macro photography. Which is good, because that’s a big part of why I purchased it. Mind you, the EVF is still not as good as an optical viewfinder: the view is slightly delayed, and like a movie or TV set it’s a sequence of still pictures in rapid succession, not a true moving view. It’s also a discrete set of pixels with a noticeable grain to it. But the point is it’s close enough to a true live view on a ground-glass screen to be completely useful, even in fairly gloomy light. In fact, it can make it surprisingly easy to focus in gloomy light, because what you’re looking at in such situations is an amplified view of the available light. It can be a little disconcerting at first to look in the finder and see a bright scene when photographing on the forest floor. On the minus side, there’s a limit to how bright the EVF can be, and it ends up looking surprisingly gloomy in bright sunny situations. It’s still far better than trying to shade the preview screen on a camera body while at the same time attempting to hold the camera still, however. Focusing the lenses feels a little on the odd side, too. Even though focusing is done in the traditional way by turning a collar on the lens, that collar is just a digital encoder which causes the camera’s CPU to tell the lens to rack itself in or out as it is being turned. But again, it’s good enough to allow precise manual focusing; it’s far better than the futile putsing around with buttons to manually focus a compact digicam. In short, EVIL cameras do not offer the performance of an SLR, and probably never will. But that’s not completely the point: a 35mm SLR does not offer the performance of an 8×10 view camera (those are the big, old-fashioned-looking cameras that are inevitably used on tripods and which photographers get under a cloth to focus), yet despite that people use SLR’s because they are smaller, lighter, and more convenient than view cameras. And so it is with EVIL cameras, particularly when compared to the size and weight of modern DSLRs, which tend to be significantly buliker and heavier than old film SLRs. Trading performance for convenience has a long history in photography. I’ve avoided purchasing a DSLR because I did not want to take that extra weight and bulk on the trail with me, and I’m pleased that my new EVIL camera will allow me to ditch even more weight and bulk. No new revelations, really: I miss how Portland is more countercultural than Seattle. I don’t miss the lousy air quality or more prolonged summer heat waves. I also don’t miss the flaky hipster factor: as an example, there’s one vegan food store in Portland that doesn’t open until 10:00 AM because none of its owners (nor, frankly, much of its clientele) are up before noon, so 10 seems almost unimaginably generously early an opening time for them. And since 10:00 AM is (by their standards) an ungodly early hour, the store almost never actually opens at the stated time of 10, anyhow. Which is annoying to anyone whose schedule isn’t based on “rock and roll hours”. I’m in Portland for what was billed as the estate sale of a friend who passed away this spring, which turned into a giveaway of possessions to friends, which then turned once more into a giveaway of only minor possessions. Which turned the trip into something of a wild goose chase, because the object I was most interested in might be valuable. In the end, it probably shouldn’t have been that big a surprise, because difficulty in managing the need to divest oneself of possessions sort of runs in that family: my friend’s mother was a compulsive hoarder who filled a whole house with stuff, and my friend then obsessed for years about meticulously sorting through all his mother’s junk. And I can’t get that angry, because the object I wanted is definitely a want and not a need. Apple recently discontinued its old Mobile Me service and replaced it with iCloud. If, like me, you’re not using OSX Lion, there’s no seamless way to change your Mail settings so that they will work on iCloud, even if you did go to the iCloud web page and say you wanted to keep reading mail from an older Mac system. Do not delete your old account! It is not necessary. Select the “Accounts” tab, then select your Mobile Me account. In the “Description” field, edit the description so that the host name after the @ reads: imap.mail.me.com . In the “Outgoing Mail Server (SMTP) selection tool, select “Edit SMTP Server List…”. Set the SMTP server for your old Mobile Me account to smtp.mail.me.com . Ensure the “Use default ports (25, 465, 587)” radio button is checked. Also ensure the checkbox next to “Use Secure Sockets Layer (SSL)” is checked. Click “OK” to save your changes and return to the accounts settings. Ensure the “Use SSL” checkbox is checked. Close the preferences window. Be sure to save your changes when asked.